« Secret Recip Club Post: Lots o’ muffins! 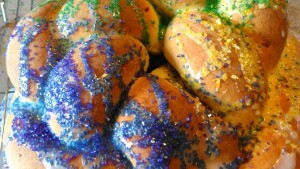 I wonder how many King Cake recipes will be posted this week since Mardi Gras is February 21 this year? Last year at my husband’s office, he found the baby in his piece of King Cake. As tradition holds, this meant that it was up to him to bring the King Cake for next year’s celebration. Next year is here. I can’t for the life of me find that little plastic baby to put into this year’s cake, but I did read that a dried bean (or even a pecan) can also be used. Good thing! Again, I went to my cookbooks for this recipe and not the internet. I found an authentic recipe in Jambalaya (15th Edition). 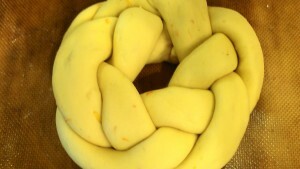 It sounded a bit daunting as I am not very artistic when it comes to braiding bread but I decided to give it a shot. I have tweaked the directions a bit. 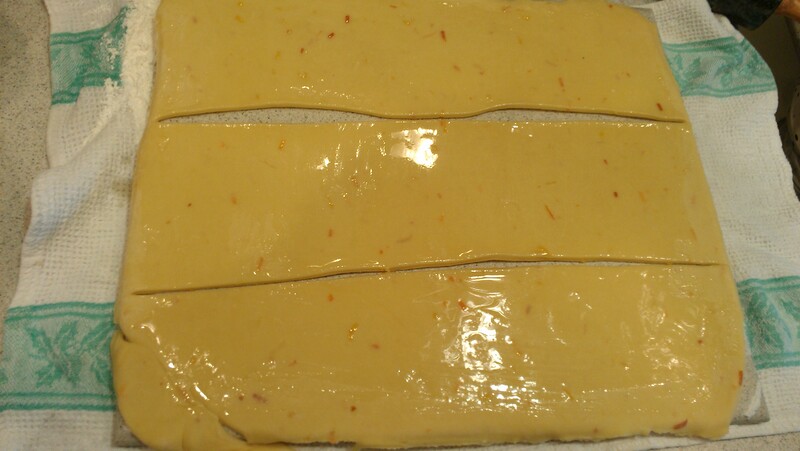 In a small sauce pan, melt 1 stick of the butter. Stir in milk, 1/3 c. sugar, and salt. Heat and stir until sugar is dissolved. Cool to lukewarm. In the bowl of a stand mixer with paddle attachment, combine remaining 2 1/2 T. sugar, yeast and warm water. Let stand 5-10 minutes. Beat eggs into yeast mixture. Add milk mixture and zests and continue to beat. 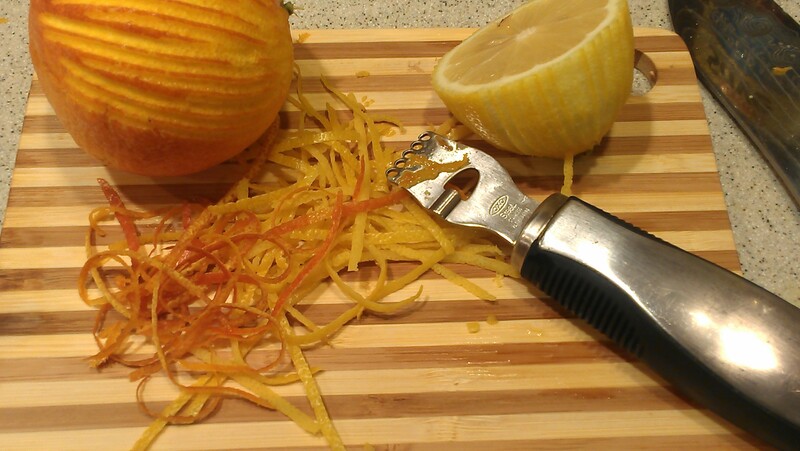 I used the zest of one whole lemon and the zest of one whole blood orange. Add flour, 1/2 c. at a time. 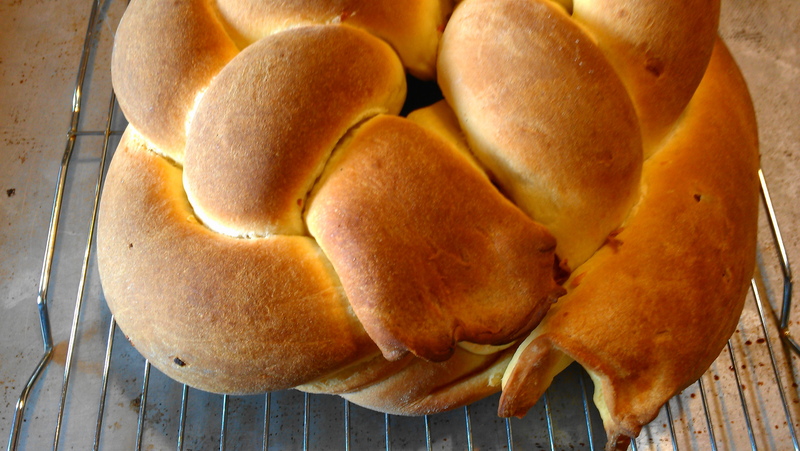 When the dough becomes more than cake-like, change out to the dough hook. Also, remember you may not need all this flour. I ended up using about 5 1/4 cups. Knead using dough hook until smooth (about 5 minutes). Grease a large mixing bowl with the remaining tablespoon of butter. 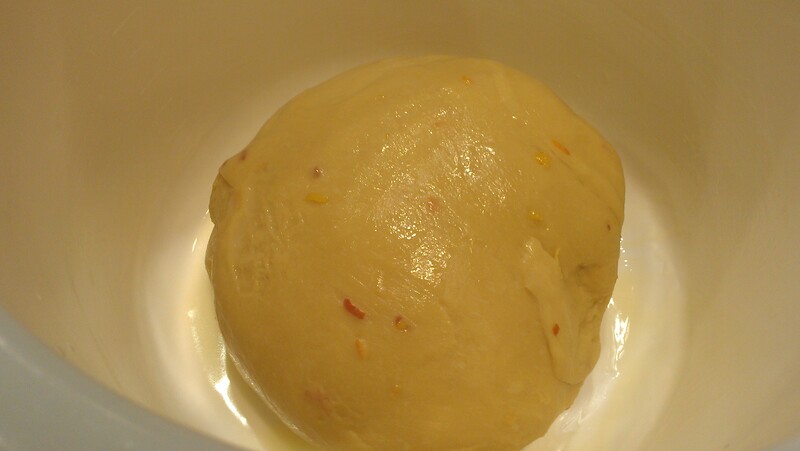 Place dough in greased bowl, turning to coat dough on top. This is a smooth dough. You can see the flecks of the blood orange zest. Cover and let rise in a warm place for about 1 hour (or until doubled). While dough is rising, make filling. Melt butter and set aside. Combine the sugars and cinnamon and set aside. After dough has risen, punch down and divide in half. On a floured surface, roll one of the dough halves into a 15″ x 30″ rectangle. Brush with half of the melted butter (from filling recipe above). Cut this dough half into 3 lengthwise strips. Sprinkle half of the cinnamon-sugar mixture on strips, leaving a 1″ lengthwise edge free for sealing. Fold each strip toward the center, sealing the seam. You will now have three (30″) strips with a sugar filling enclosed in each. Braid the strips together and make a circles by joining the ends. 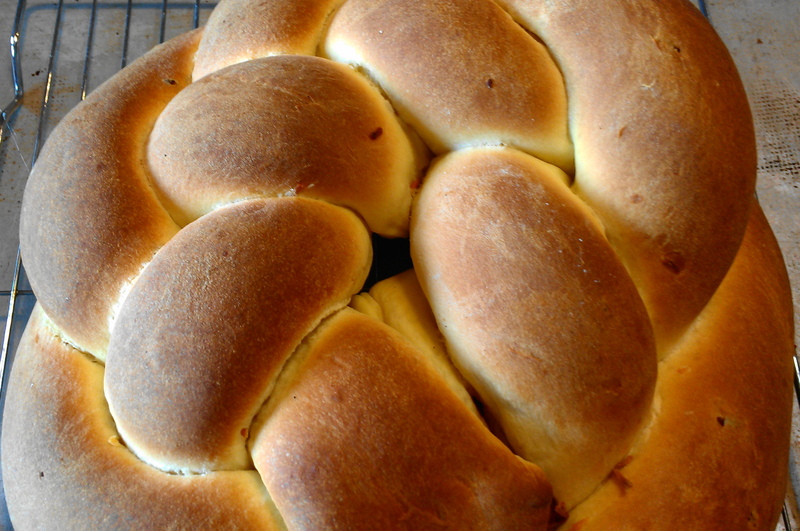 Repeat with other half of the dough so you will have two King Cakes. It's not the most beautiful braiding job, but I was pleased. Bake at 350 F for 20 minutes. Remove from pan immediately and insert the plastic baby or bean (or nut) in each cake from underneath. Let cool. The original recipe has an egg wash and sugar sprinkles. I wanted a frosting so I came up with this. Combine the sugar and lemon juice together in a mixing bowl and beat until smooth. Add water until the icing reaches desired consistency. Use more water to thin as needed, or conversely, more powdered sugar for a thicker glaze. When cake is cooled a bit, frost and decorate with sparkling sugars. In New Orleans, this cake is served during Carnival season from the Feast of Epiphany (January 6) until Mardi Gras (the day before Ash Wednesday). The person receiving the plastic baby is considered lucky. By custom, that person must also supply the next King Cake. Good lookin' from this angle. However, from this angle it looks kind of pitiful. Confession: I did go to the internet for a lighter version of this traditional fare. Check out Claire Gallam’s recipe for a Lighter King Cake recipe at She Knows. (I even decreased the amount of sugar in the filling and it was still delicious AND it is much easier to make!) This may be my new recipe for Mardi Gras. This is Claire's recipe that was baked in a bundt pan. I hope everyone enjoyed Carnivale this year. 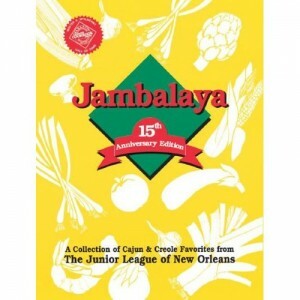 I am also making gumbo to take to work tomorrow. We have another long day tomorrow—there until 7:30 p.m. So, the freezer is minus two pints of Okra Gumbo Freezer Mix and a bag of frozen chicken breasts. The pantry is minus one quart or tomatoes and some rice. 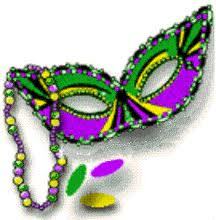 With Gumbo and a King Cake, we will have our own celebration! I made this a few years ago for a church Shrove Tuesday celebration, but since it is just my husband and I now that my daughter is off at college, I don’t make it because we will eat way too much of it, lol. I went overboard with three cakes, yes! I am taking the lighter one to work and hubby is taking the traditional one. Only the two of us here too, but we have pretty much powered through the pitiful (yes pitiful) braided one. Those look very pretty. 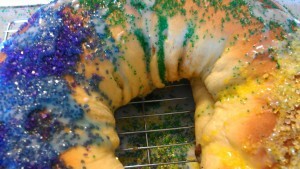 This is the first King Cake blog I have seen. Thanks! Please check out Claire’s recipe though. It is sooooo good (and healthier). I love king cake! Yours came out great! Seriously, the lighter version is easy-peasy. Dump it in a bundt pan! I really like it better than the New Orleans recipe. Your King cake is beautiful, really beautiful. I have found the babies at craft stores, Like Michaels. I’ve actually never made a King’s cake (only buy them), but I’ve used the babies at baby showers. I looked at Hobby Lobby for them but to no avail. I will try Michael’s next year. Thanks. I was wondering if there was a baby in there 🙂 Your King Cake looks very delicious! Actually, I forgot to stick one in the cake I brought to work today. Doh! Doesn’t matter how many king cakes are posted when yours is the MOST gorgeous!!! Beautiful! Wow, Jen. Thanks a bunch! I never made my own king cake when I loved in NOLA–and sigh, I’m getting nostalgic just looking at yours. It looks awesome in that sugary, gooey perfectly Mardi Gras kind of way! Doh! I forgot to hide a baby, bean or nut in the cake. I told hubby just to act like he got it. I guess I’m baking next year too. They both turned out so pretty! 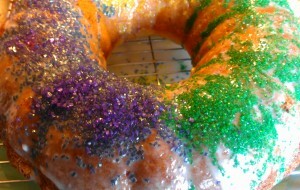 King Cake has always been intimidating to me but I plan to make it some day. Now I have two great recipes to choose from! Will you get to taste either one? I did. I ate a bit of each. You have to make Claire’s recipe. It is awesome.